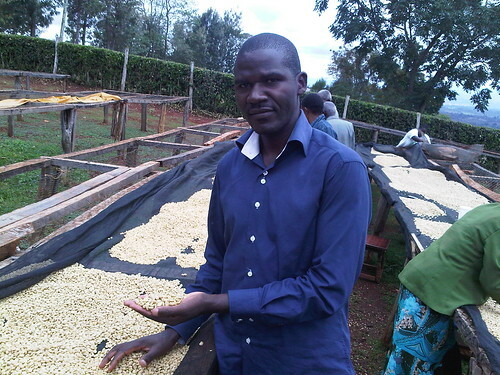 The coffee we sell that is the Kagumo Peaberry comes from the KAGUMO-INI MILLING STATION. Kagumo-ini milling station or ‘factory’ as they are known in Kenya is a part of Mugaga Farmer’s Cooperative Society (MFCS) found in Nyeri district Kenya. Nyeri lies between the western slopes of Mt. Kenya and the eastern side of the Aberdare Ranges. Both of these are volcanic formations. This means that the region has red volcanic soils and lies on an altitude of above 1600 metres. This makes it very ideal for growing coffee. Coffee in this Co-op is produced mainly by small scale farmers with holdings of about 1 hectare each. These farmers grow their coffee among other crops like bananas, and trees. Trees like macadamia and eucalyptus help to provide shade for coffee plants. MFCS trains members regularly on sustainable farming practices. They have incorporated a system of transparency and therefore all members are able to access data to see sales progress and turnover for each harvest.